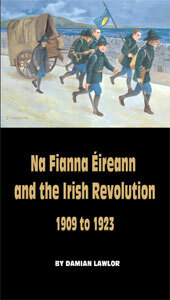 A NEW BOOK on the history of Na Fianna Éireann, Na Fianna Éireann and the Irish Revolution, 1909 to 1923, has just been published by Damian Lawlor to mark the 100th anniversary of what used to be the republican youth movement. Na Fianna Éireann was founded on 16 August 1909 in an old rundown hall at 34 Lower Camden Street. A committee which included Constance Markievicz and Bulmer Hobson called the meeting to recruit boys in Dublin to a new nationalist body. The hundred or so boys who attended were creating an organisation offering an alternative to the British and growing Baden-Powell Boy Scout movement. What developed over the next 14 years was a veritable boy’s army which played a crucial role in the Irish revolution. This book is unique in telling the history of Na Fianna Éireann. It charts its growth and development from 1909 to 1923, giving, for the first time, access to the stories of individual members. The book also analyses its expansion into a truly national organisation with over 30,000 members spread throughout Ireland’s 32 counties. • The Fianna’s participation in the Tan War.